Hero Rajasekhar’s upcoming action thriller, PSV Garuda Vega 126.18M, is all set for a grand release on November 3. There has been a huge buzz around the film ever since the film’s grand, stylishly shot teaser and theatrical trailer were unveiled. To take this positive buzz to the next level, the film’s overseas distributors at Wall Poster Cinema have already kick-started the promotions, starting from Connecticut. 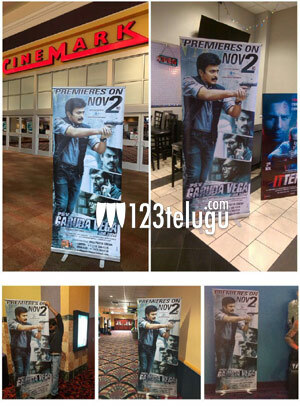 Standees have been put up across all the 80 screens that will premiere Garuda Vega on November 2. Praveen Sattaru has directed the film and M Koteswara Raju has produced it. Pooja Kumar is the film’s leading lady and Shraddha Das will be essaying News reporter’s role. Sunny Leone has sizzled in a special song.